Emma's Garden Bedding by Waverly is a romantic floral with bouquets of lilacs and cabbage roses in delicate pinks and mossy greens. The inspiration for this ensemble comes from the hillside English gardens described in a classic Jane Austen novel. A crossweave pattern in a soft green and neutral beige appears on the reverse of the quilt and as trim on the scalloped edge of the quilt and the shams. The bedskirt is also done in the crossweave pattern. Layer throw pillows for more interest and add window treatments in this lovely floral as a finishing touch. Each reversible quilt is crafted of 100% woven pre-washed cotton. Twin quilt set includes one reversible 68" x 86" quilt, one gathered 39" x 75" bed skirt with a 15" drop, and one pillow sham 21" x 26". Full Queen quilt set includes one reversible 88" x 90" quilt, one gathered 60" x 80" bed skirt with a 15" drop, and two pillow shams 21" x 26". King quilt set includes one reversible 104" x 90" quilt, one gathered crossweave pattern 78" x 80" bed skirt with a 15" drop, and two 21" x 36" pillow shams. Daybed quilt set includes one reversible 105” x 54” daybed quilt, one 75” x 39” gathered crossweave pattern bed skirt with 15” drop, and three 21” x 26” standard pillow shams. Imported. Machine wash cold, gentle cycle. Tumble dry low. 100% cotton. Pillows are spot clean only. 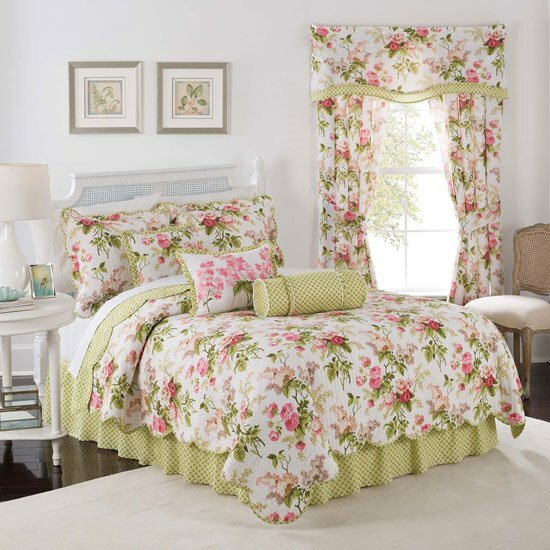 Emma's Garden Twin Waverly Quilt Set is a romantic floral with bouquets of lilacs and cabbage roses in delicate pinks and mossy greens inspired by classic English gardens of a Jane Austen novel. A crossweave pattern in a soft green and neutral beige appears on the reverse of the quilt and as trim on the scalloped edge of the quilt and the sham. Each reversible quilt is crafted of 100% woven pre-washed cotton. Twin quilt set includes one reversible 68" x 86" quilt, one gathered crossweave pattern 39" x 75" bed skirt with a 15" drop, and one pillow sham 21" x 26". Machine wash cold, gentle cycle. Tumble dry low. 100% cotton. Emma's Garden Full Queen Waverly Quilt Set is a romantic floral with bouquets of lilacs and cabbage roses in delicate pinks and mossy greens inspired by classic English gardens of a Jane Austen novel. A crossweave pattern in a soft green and neutral beige appears on the reverse of the quilt and as trim on the scalloped edge of the quilt and the sham. Each reversible quilt is crafted of 100% woven pre-washed cotton. Full Queen quilt set includes one reversible 88" x 90" quilt, one gathered crossweave pattern 60" x 80" bed skirt with a 15" drop, and two pillow shams 21" x 26". Machine wash cold, gentle cycle. Tumble dry low. 100% cotton. Emma's Garden King Waverly Quilt Set is a romantic floral with bouquets of lilacs and cabbage roses in delicate pinks and mossy greens inspired by classic English gardens of a Jane Austen novel. A crossweave pattern in a soft green and neutral beige appears on the reverse of the quilt and as trim on the scalloped edge of the quilt and the sham. Each reversible quilt is crafted of 100% woven pre-washed cotton. King quilt set includes one reversible 104" x 90" quilt, one gathered crossweave pattern 78" x 80" bed skirt with a 15" drop, and two 21" x 36" pillow shams. Machine wash cold, gentle cycle. Tumble dry low. 100% cotton. Emma's Garden Waverly Daybed Quilt Set is a romantic floral with bouquets of lilacs and cabbage roses in delicate pinks and mossy greens inspired by classic English gardens of a Jane Austen novel. A crossweave pattern in a soft green and neutral beige appears on the reverse of the quilt and as trim on the scalloped edge of the quilt and the shams. Each reversible quilt is crafted of 100% cotton. Daybed quilt set includes one reversible 105” x 54” daybed quilt, one 75” x 39” gathered crossweave pattern bed skirt with 15” drop, and three 21” x 26” standard pillow shams. Machine wash cold, gentle cycle. Tumble dry low. 100% cotton. Emma's Garden 14x20 Decorative Pillow has delicate bouquets of flowers in blush and soft pink on green leafy stems on a white ground. A soft green and beige crossweave pattern pleated flange trims the edges. 14" x 20". Hidden zipper closure. Spot clean only. 100% prewashed cotton. Imported. Emma's Garden 18x18 Decorative Pillow is a romantic floral with bouquets of lilacs and cabbage roses in delicate pinks and mossy greens inspired by classic English gardens of a Jane Austen novel. A soft green and beige crossweave pattern flange trims the edges. 18" x 18". Hidden zipper closure. Spot clean only. 100% prewashed cotton. Imported. Emma's Garden 7x20 Decorative Neckroll Pillow is done in a soft green and beige crossweave pattern accented by two rows of center ruffling. 7" x 20". Hidden zipper closure. Spot clean only. 100% prewashed cotton. Imported. Emma's Garden Lined Window Valance is a romantic floral with bouquets of lilacs and cabbage roses in delicate pinks and mossy greens inspired by classic English gardens of a Jane Austen novel. A band in a green and beige crossweave pattern trims the softly scalloped hem. 52" x 18". 2" header. 3" rod pocket fits up to a 2.5 inch rod. 100% prewashed cotton with poly/cotton lining. Machine wash cold, gentle cycle. Tumble dry low. Cool iron of needed. Imported. Emma's Garden Lined Panel Pair is a romantic floral with bouquets of lilacs and cabbage roses in delicate pinks and mossy greens inspired by classic English gardens of a Jane Austen novel. Each panel is 50" x 84". 3" rod pocket and 3" back tabs fits up to a 2.5 inch rod. 100% prewashed cotton with poly/cotton lining. Tiebacks included. Machine wash cold, gentle cycle. Tumble dry low. Cool iron of needed. Imported.